September is one of my favourite months for seasonal baking. Apples, pears, damsons and plums a plenty, there are so many ways to bake with all these incredibly delicious and nutritious fruits. I am particularly partial to plums, due to their endless health benefits; including relief from indigestion relief and anxiety- related illness. The antioxidant power of plums can help treat osteoporosis, cancer, diabetes and obesity. It also contributes to the body’s ability to maintain healthy levels of cholesterol, cardiovascular and cognitive health, immune system strength, electrolyte balance, as well as boosts collagen production. I love walnuts, not only as they taste completely delicious, but they’re also full of vitamin E content and omega-3 fatty acids. 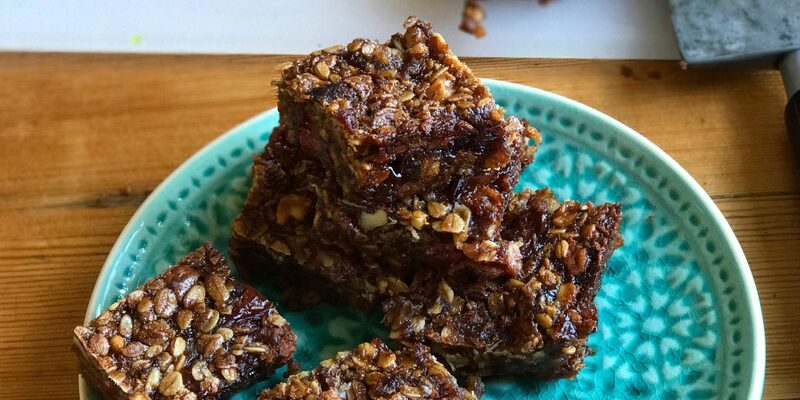 These flapjacks are bursting with goodness! They contain low Gi-sugar and tons of fiber – a perfect way to refuel post-workout or mid-afternoon at the office. For a fully vegan recipe, swap the honey for some agave nectar or maple syrup. Pre-heat your oven to 200C/180C fan and grease a 20×20 cm tin with a little coconut oil – or line with baking paper if it’s non-stick. In a large bowl, toss the plums in the ground ginger and cinnamon, with 50g of the coconut sugar and a small pinch of salt, then set aside to macerate. Gently melt the coconut oil with the honey in a saucepan. In a large bowl, mix the oats, flour, walnut pieces and remaining sugar together, then stir in the coconut oil and honey until everything is combined into a loose flapjack mixture. Grease a square baking tin about 20 x 20cm. Press half the mixture over the base of the tin, then tip over the plums and spread to make an even layer. Press the remaining oat mixture over the plums so they are completely covered right to the sides of the tin. Bake for 45-50 minutes until golden and starting to crisp around the edge of the tin. Leave to cool completely, then cut into squares. These will keep in an airtight container for 2 days or can be frozen for up to a month.